OneUniversity Finance – we’re here to help! Team members Emma McDade, Lyle McDonald and Joanna Stephens modeling the latest fashion in Business Transformation attire. We’ve been getting asked what will happen when we go live, especially with technical support. In the days immediately after go live we’ll have people on hand locally to help you with general queries – this might be your change champion, someone from IT or the BT Programme, or someone who’s taken part in Key User Training. 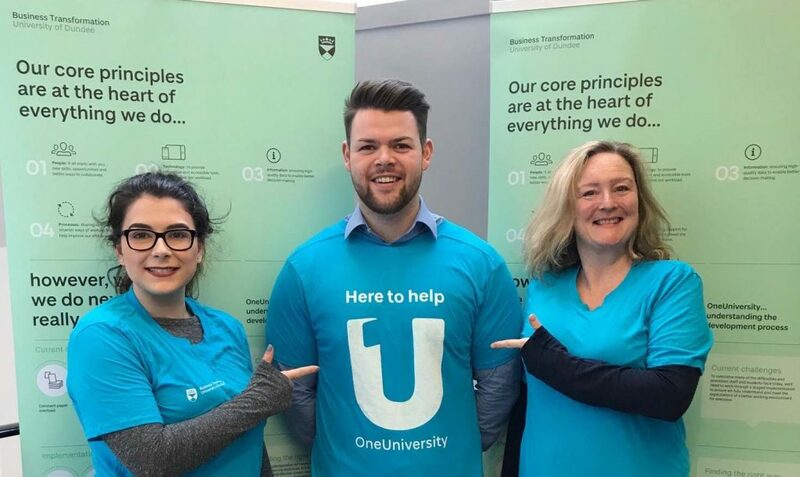 We’ll publish a list of who these people are on Box but they’ll be identified by their bright blue t-shirts with the OneUniversity logo! In addition to this we’ve created a bank of Frequently Asked Questions within the IT portal which will be available soon. Just login, select the OneUniversity tile and search! We’ll update this daily so you can be guaranteed that the latest information and support will be there. If you still can’t find the answer you should raise a ticket with the Service Desk where it will be assessed and allocated to the appropriate group/person to resolve and respond. We know that it’ll be busy, particularly during the first week, so help us to help you by trying the FAQ’s before raising a ticket and, unless absolutely critical, avoid calling the Service Desk. Raise a ticket with Help4You and they’ll get on it ASAP. Thanks in advance for your support and understanding! Author Michael McDonaldPosted on 9th November 2017 Categories About the programme, trainingTags business transformation, end user training, floor walkers, OneUniversityLeave a comment on OneUniversity Finance – we’re here to help! Q. Hi Carrie, what’s the P for in PMO? A. I’m asked this question a lot! It’s P for programme. I’m the analyst for the Programme Management Office of the Business Transformation group. Q. What does the Programme Management Office do? Q. What’s it like collaborating with different workstreams? A. We’re here to support all of the workstreams, not just one area. This means we have to have a wide knowledge across the Programme. We also need to have an awareness of other activity happening across the University. Q. You’re an analyst. What do you analyse? A. Our analysis helps to support decision making, planning and reporting to name a few areas. We support all the workstreams – HR and Payroll, Research and Projects, Student, Enquiry Management – but right now we’re heavily focused on the Finance and Procurement workstream. 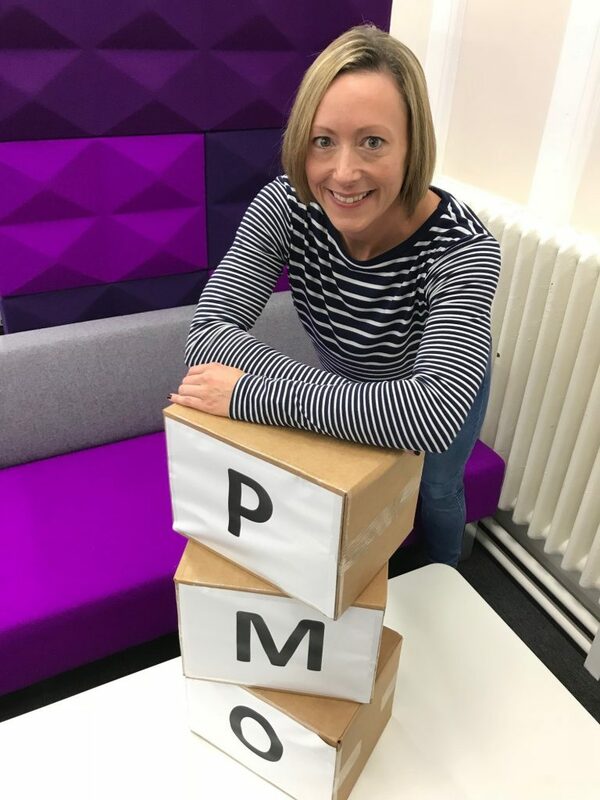 In the run up to our December go-live date the PMO have created a new planning framework. ‘How long will it take? What resources will it require?’ These are the key questions we address to assure Finance and Procurement have workable timescales and available means. Q. What is your favourite part of the job? A. When you work on a project, especially one of this size, there is a broad scope of things you are working on, so no two days are the same. Q. What are the top three skills required in your role? A. Planning, being able to apply your continual learning and risk management. That’s having a good back-up plan! Q. You celebrated one year working on the project this month. What’s the most rewarding thing that’s come out of it for you? A. I’ve really enjoyed being part of the Business Transformation team working on OneUniversity. 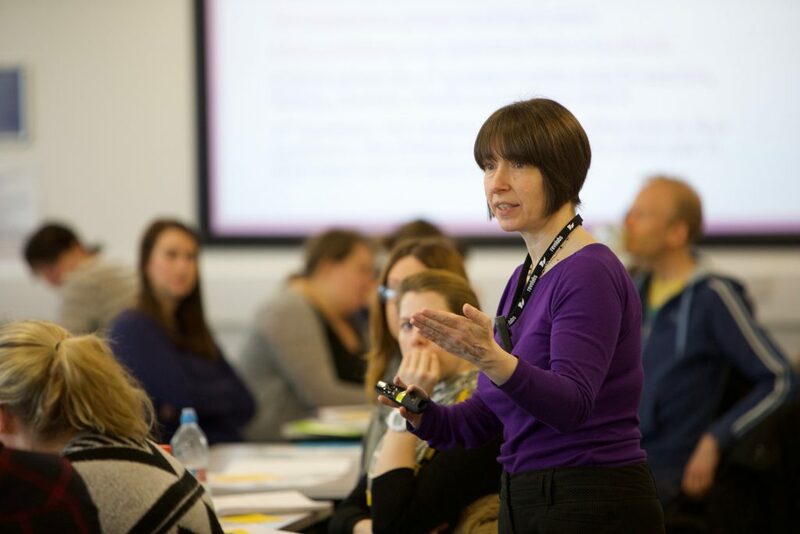 The team is made up of a wide array of people from across the University and from other organisations who bring a wealth of experience to the programme. It’s nice knowing that you are part of a programme of work that will support the University in achieving its strategic goals. Requisitioning end user training kicks off on Monday 13 November and will continue up to Wednesday 29 November. School Managers and Directors have nominated colleagues to take part in the training so that knowledge from those sessions can be cascaded to their teams. Separate training sessions for Stores Management, Receipting and General Navigation will be held at Ninewells and Life Sciences. A wider education programme including a range of training resources are being developed and will be available before go live. Drop-in sessions will take place in the New Year where you bring your expenses along and we’ll help you process them. Requisitioning demos will take place on the dates below. Come along and see how to process a simple requisition. With OneUniversity you can submit your expense claims electronically, taking photographs of your receipts on your phone and uploading them with your claim. By doing it this way we cut out the paper, and you get paid with less fuss. You continue to submit expenses in the traditional way until 5:00 p.m. on Tuesday 21 November after which there will be a freeze on claims until we switch to OneUniversity. Q: Do I have to submit my own expenses? A: Of course we’d prefer people to take responsibility for their own expenses but we appreciate this is not always possible or the best use of time. OneUniversity will let you delegate your expense claim to another person to do on your behalf. It’s important to note that, whoever the delegate may be, the person who has incurred the expenses will be accountable for the eligibility of their claim. Q: When will my expenses be paid? A: Your expenses will be paid in the first payment run in OneUniversity. After that, the next weekly staff payment run will reimburse any expenses that fall under the pre-approval limit of £50. 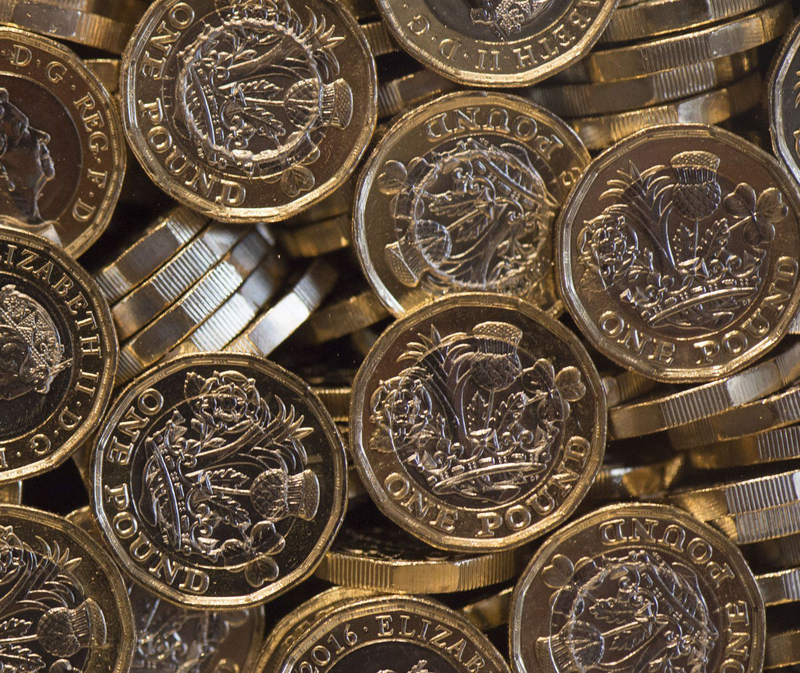 Expense claims requiring approval will be paid in the payment run after they’ve been approved. Q: How are external expenses being managed? A: For now, we’re managing external expenses in the same way as we do at present. You can submit an external claim form that has been signed off and financially coded using the new coding string to Accounts Payable. We’ll pay these claims in the same way as commercial creditors and include them in the payment run along with our suppliers. We’re currently setting up business process management (BPM) forms so we’ll all soon be able to submit external claims online. Q: How will I learn to do my expenses? A: The solution is intuitive and easy to navigate so you’ll be able to familiarise yourself with it as soon as we go live. We’ll hold drop-in sessions all over the University where you can bring along your expenses and receipts and we’ll guide you through the submission process. In addition to this we’ll be arranging sessions looking at the new coding string, as well as advanced training with staff likely to have some responsibility for putting in expense claims on behalf of others. Q: What about student expense claims? A: There will be no immediate change to how we manage student claims. We will, however, be amending the claim form to take account of the new coding string and moving towards and online submission process. * Exceptions are travel insurance claims, removal expenses, taxable benefits and staff prizes.